I argued that this is a mistake. The Core Bus Corridor cycleway has a massive gap between Snugborough Rd and Auburn Ave. 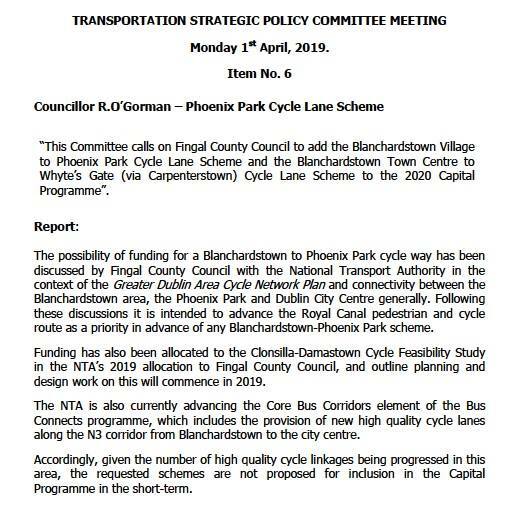 The Blanch-Phoenix Park route could fill that gap. Anyone going to west or south city centre is more likely to use Whyte’s Gate/Park than the Greenway route. 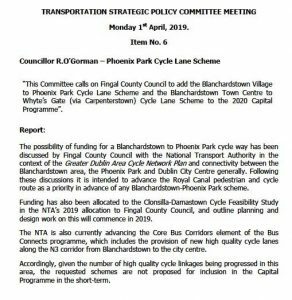 Also, many students attending Castleknock Community College and Castleknock College cycle to school and would benefit from a cycle-lane along Carpenterstown Road. While the Greenway will be great and bus corridor cycle lane ok, I think we are missing a trick on two routes that are already popular but not safe enough. As I said at the meeting, I’m not going to drop this as I believe these two routes are crucial for D15 commuters to take real advantage of our proximity to the city.